The Archdiocese of Australia gives its blessing. The All-Good God guides and adds to the effort. Sixty years this year of the Orthodox Christian Society. An unbroken Christian witness. Members of the Greek Orthodox Christian Society, 1956. In the front row, third from right and third from left are the founding members of the Society, Dr Michael Anthony and Mr Phidias Kyriakides. Who can recount how many miracles have materialised in those six decades!The “right hand” of our Holy Archdiocese, according our current Archbishop Stylianos, who for the last 40 years, leads the Orthodox Church of Australia and supports the work of our Society. Missionary visits in Australia and overseas. That a respectable amount of monastics and clergy in Australia and Greece came from the Orthodox Christian Society is an additional seal of the work of the Holy Spirit amongst us. Together with these achievements we remember the difficult times in our Church when the Society was called to publicly stand against people acting “as savage wolves…. not sparing the flock” (Acts 20:29) in support of our Archdiocese. Above and beyond these historical achievements in the life of the Orthodox Christian Society, the experiences which we as its members have lived through these past 60 years have surely been unique and exceptional. Whilst living in a materialistic and despiritualised world, we learned early on that we are surrounded by much falsehood and disbelief. And that we need to testify to the Truth. “I am the way, the truth, and the life.” (John. 14:6). That as members of the Orthodox Christian Society, we need to live by this truth and exhibit it in all aspects of our missionary work. This is how we learned that whoever battles for the Truth of Christ, will always be victorious. Sixty years, one lifetime and the memories stream forth unceasingly, a true torrent of holy and unforgettable experiences. As we walk through the years, all of us brothers in Christ, those who started 60 years ago, or only one year ago, it makes no difference. What counts is that we are bound by indissoluble bonds, which will never be extinguished. The more senior of us together with those who are younger. The members of all the groups, family men, parents, grandfathers and young men. One supporting the other. All being joyful in the happiness of the one, sharing in each other’s grief, finding comfort in brotherly support. This is because Christ is in our midst. With Christ’s presence amongst us together with the blessings of our Church, let us wish that the next 60 years are as spiritually edifying for our members and for all our Orthodox brothers and sisters. The men of the Greek Orthodox Christian Society at their most recent annual Camp, February 2015. 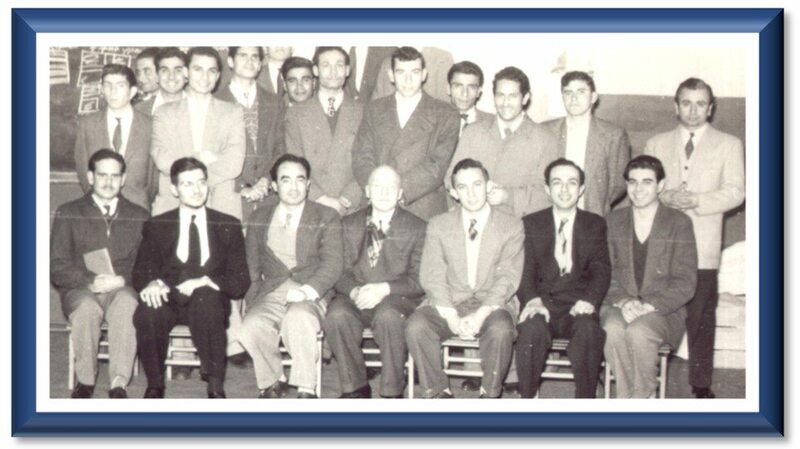 February 1955 – The Greek Orthodox Christian Society’s first official ‘Sunday School’ class is instituted by Professor Michael Anthony and Kyrie Phideas. The class is held in the afternoon Greek school on Todman Avenue in Kensington. Lessons are held on Fridays, from 4.45 to 5.30 pm. February 1955 – The first Enosi meeting is held at the Church of Agia Sophia, Dowling Street in Paddington. 1956 – A second Sunday School is started in the hall of the then Cathedral Church of Saint Sophia, in Paddington. The lessons are held on Saturday mornings, from 10 to 11 am. 1957 – A third Greek Orthodox church – The Dormition of Our Lady – is established in Sydney at Abercrombie Street, Redfern, A Sunday School is established there within weeks, and lessons are held on Sundays, during the Liturgy, from 9 to 10.00 am. 1958/59 – The Women’s Fellowship Group (Kyklo) holds its first meeting under the leadership of Kyria Anna Tsilivi. 1977 – The Society purchases new premises at Enmore Road, Newtown where a new bookstore is opened. 1977 – Elder Paisios (now canonised) visits Sydney. January 1986 – The boys and girls Youth Fellowships hold their annual retreats at the George Ween Conference Centre, Otford. The Greek Youth Christian Society holds its retreat at Hopewood House, Bowral. 1996 – Patriarch Bartholomew I visits Australia and attends the 40 years of Sunday School concert. 2000 – The Men’s Fellowship expands again with the creation of a new group for the youngest members of the society (Trito Kuklo) set up under the leadership of Dr Gregory Roditis. 2005 – Dr John Psarommatis succeeds Professor Michael Anthony as President of ENOSI. October 2005 – First Sunday School Camp held at Challenge Ranch Somersby. Around sixty Sunday School children from parishes across Sydney attend. July 16th 2005 – The foundation stone of the New Pantanassa Monastery, Mangrove Mountain, is laid by His Eminence Archbishop Stylianos. July 2010 – Enosi conducts a missionary visit to the Greek Orthodox churches in Townsville. December 2012 – First missionary visit to Indonesia: a small group of Enosi doctors, pharmacists and dentists visit Medan Province in Indonesia. July 2014 – Enosi conducts a missionary visit to the Greek Orthodox Churches in Adelaide. December 2014 – The Society conducts its second missionary visit to Indonesia. July 2015 – Enosi conducts a missionary visit to the Greek Orthodox churches in Perth. November 2015 – Bishop Seraphim officially opens the new Orthodox Mission Bookstore at its new Kingsgrove premises. July 2016 – Enosi conducts its second missionary visit to Adelaide in as many years and assists in the creation of Adelaide’s own Greek Orthodox Christian Society. Enosi begins its practice of sending speakers from Sydney to the Men’s Fellowship in Adelaide.